Originally built as stables, then converted into housing, our luxury cottages are perfect for a getaway to the Peak District. Situated down a quiet country lane, away from any built up areas. No traffic, no people. You can take the time to completely de-stress in a luxury five-star holiday cottage. Magpie Cottages are spacious and are fitted with their own kitchens and bathrooms. The cottages are decorated with modern décor and modern utilities, including TV with Freesat, CD player with iPod dock, Wi-Fi, and a range of other free stuff including peak district cottages with a hot tub. Just ask us on arrival. 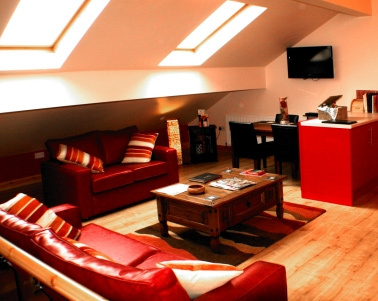 Our Harvest, Holly and Goyt luxury cottages are located in the converted hayloft. Harvest and Holly have modern and up to date décor, and Goyt has a “shabby-chic” style to it, with a slightly modern twist. Bluebell and Wild Orchid are situated on the bottom floor of the hay loft, featuring a traditional aesthetic. Both cottages feature a patio, where you can have a BBQ overlooking the river. There are also plenty of things to do around our luxury holiday cottages. Peak District attractions are a short drive away, and we have plenty of walks nearby, and numerous places for anglers to spend the day fishing. A complete list of the nearby attractions can be found on our attractions page. We will do our best to make sure we can cater for the needs of everyone. Please don’t hesitate to let us know if there is anything we can do to make your stay in our boutique self-catering cottages more pleasant. For any enquiries on our luxury Peak District cottages with hot tub included, please feel free to contact us through the website. Alternatively, you can give us a call on 07718 341 193. We’ll do our best to provide you with as much as we can.